Teams of students from Poly High School won first, second and third place in various categories at Project ECHO’s 11th annual business plan finals competition held April 12 at the UCLA School of Management. More than 100 teams and 500 students from across the Southland competed by presenting their written business plans. The Project ECHO (Entrepreneurial Concepts Hands On!) competitions simulate the real-world process of entrepreneurs soliciting start-up funds from investors. Judges act as venture capital investors deciding on which business they would most likely fund. Winning first place and $1,000 in the retail-based business category was the “Long Beach Tech Center” team from Poly’s PACE academy. Team members Pascha Hao, Sasha Rosenthal, Erin Osman, Nia Kelley and Christine Morrison collaborated with the Long Beach Unified School District, Shared Science and other partners to support the opening of a facility for engineering and robotics that would be accessible to LBUSD students. The team’s economics teacher, Daniel Adler, has been a champion of Project ECHO. Nineteen teams from Poly’s CIC, Pac-Rim and PACE academies competed in the finals. The first place winners’ plan is actually coming to fruition. LBUSD’s new Sato Academy of Mathematics and Science, which begins classes in September, has committed to providing classroom space for the start-up of the proposed Long Beach Tech Center. “We especially hope that this reaches students in lower socio-economic areas of LBUSD to support their interests in science, technology, engineering and math careers,” said team member Sasha Rosenthal. Winning third place in the same category was a plan titled “S.Y.N.C.” from Poly Pac-Rim students T’Airra Green, Jason Lim, Garrison Gowens and Romeo Lansing. Poly PACE earned a second place award in the technology-based category with a plan titled “Study Bubble.” Team members were Becca Gutierrez, Kayla Gibson, Lexi Reker, Abbi Brown, Kennelly Khem and Fiona O’Leary. Earning the Poly Jackrabbit Award in competition among Poly students only at the event was the plan titled “Loaf of Life” by Poly PACE students Clea Stammler, Zenita Leang, Rhiannon Lang, Brenna Knap and Claire Barr. 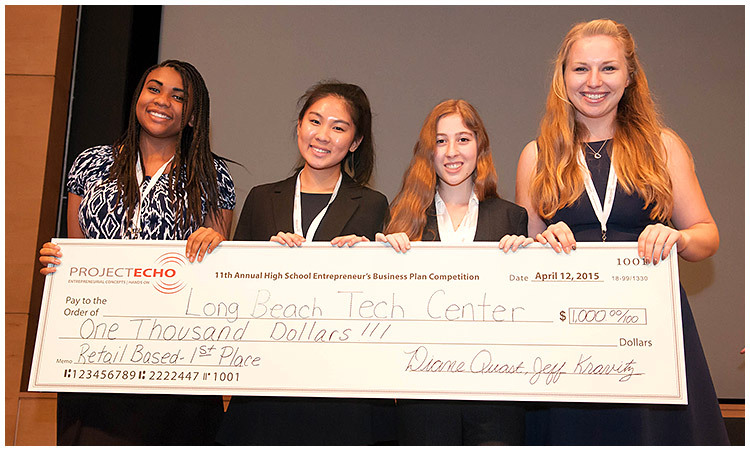 WINNING PLAN – Poly High School students Nia Kelley, Pasha Hao, Sasha Rosenthal and Christine Morrison won a first place prize and $1,000 in the Project ECHO business plan competition at UCLA. The team proposed a robotics and engineering technology center.